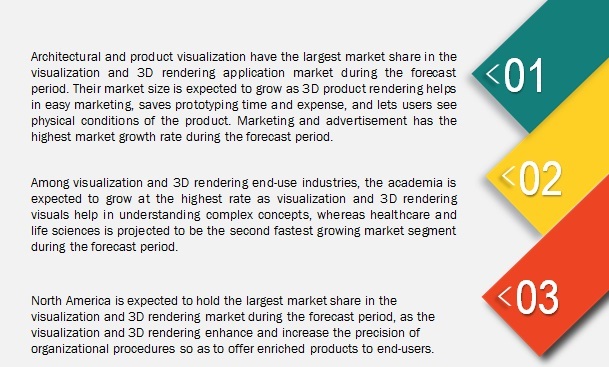 [119 Pages Report] The global visualization and 3D rendering software market size is expected to grow from USD 1.06 billion in 2017 to USD 2.92 billion by 2022, at a Compound Annual Growth Rate (CAGR) of 22.40% during the forecast period. The base year considered for the study is 2016 and the forecast period is 2017–2022. Visualization and 3D rendering is a process of developing and processing 3D model into a pixel perfect 3D photorealistic image, which can be used by the end-users such as architecture, building and construction, media and entertainment, design and engineering, healthcare and life sciences, and academia, and others (GIS and forensic science industry). The base year for the study is 2016 and the forecast period is considered to be 2017 to 2022. Communication is considered as one of the most important aspects of marketing a product. Visual communication creates the highest impact on the target audience’s mind. The concept of marketing has witnessed a paradigm shift from conventional marketing practices to the use of photorealistic visuals. These visuals are generated from visualization and 3D rendering software that provides a clear and detailed representation of the product to the clients. The clients can also provide feedback about the product in the real-time which helps designers and engineers to modify their design. Marketing with 3D rendering provides endless flexibility to visualize the product from different multiple angles. This method proves to be fast, cost-effective, and economical marketing the product. To forecast the market size of market segments with respect to five major regions: North America, Europe, Asia Pacific (APAC), Middle East and Africa (MEA), and Latin America. This research study involves extensive usage of secondary sources, directories, and databases (such as D&B Hoovers, Bloomberg Businessweek, and Factiva) to identify and collect information useful for this technical, market-oriented, and commercial aspect of the market size. The research methodology used to estimate and forecast the market begins with capturing data on key vendor revenues through secondary research. The vendor offerings are also taken into consideration to determine the market segmentation. 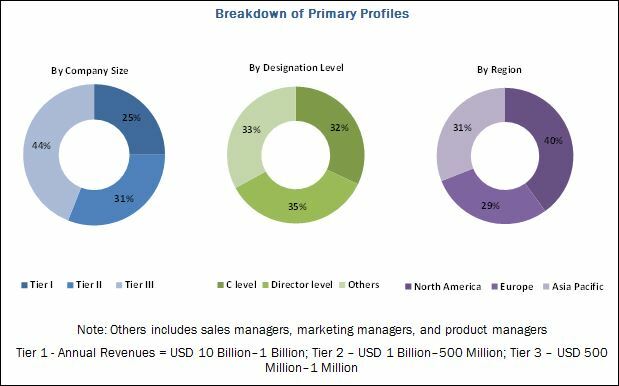 The bottom-up procedure is employed to arrive at the overall market size of the visualization and 3D rendering software market from revenues of key players in the market. After arriving at the overall market size, the total market has been split into several segments and subsegments. The figure below shows the break-down of the primaries on the basis of company, designation, and region, conducted during the research study. The figure below shows the break-down of the primaries on the basis of company, designation, and region, conducted during the research study. The visualization and 3D rendering software market ecosystem comprises vendors, such as Autodesk, Inc (California, US), Siemens AG (Munich, Germany), Adobe Systems (California, US), Dassault Systèmes (Vélizy-Villacoublay, France), NVIDIA Corporation (California, US), Trimble, Inc (California, US), Next Limit Technologies (Madrid, Spain), Corel Corporation (Ottawa, Canada), SAP SE (Walldorf, Germany), Chaos group (Sofia, Bulgaria), The Foundry Visionmongers Ltd (London, UK), NewTek, Inc (Texas, US), Render Legion S.R.O. (Prague, Czech Republic), Luxion, Inc (California, US), and Cristie Digital Systems (California, US). These Visualization and 3D Rendering Software Vendors are rated and listed by us on the basis of product quality, reliability, and their business strategy. Please visit 360Quadrants to see the vendor listing of Visualization and 3D Rendering Software. In January 2014, Autodesk has acquired Circuits.io. The acquisition helps in expanding Autodesk’s offering in electronic circuit design and simulation. In May 2016, Siemens acquired CD-adapco to enhance its product portfolio in simulation software solutions. In April 2017, Dassault Systèmes formed a partnership with Sogeti High Tech so that Sogeti would help in enhancing Dassault Systèmes’ 3DEXPERIENCE platform for 3D printing. In September 2016, NVIDIA entered into a partnership with Maxon, a leading developer of professional 3D modeling, animation, painting, and rendering solutions. This partnership enabled NVIDIA to give access to its rendering technology such as NVIDIA Ray and Material Definition Language to its commercial client. The visualization and 3D rendering market report is broadly segmented into the following applications, deployment type, end-user, and region. MarketsandMarkets forecasts the visualization and 3D rendering software market size to grow from 1.06 billion in 2017 to USD 2.92 billion by 2022, at a Compound Annual Growth Rate (CAGR) of 22.40% during the forecast period. Just-in-time marketing and user-friendly renderer interface are some of the driving factors of the market. The visualization and 3D rendering software solutions are gaining traction in the current 3D computer graphics ecosystem in various industry verticals such as design and engineering, architecture, building and construction, media and entertainment, and healthcare and life sciences. Visualization and 3D rendering are different points of a 3D workflow in which the graphical content is created using 3D software. These enable the visual presentation of the objects for different purposes in various industry verticals including architecture, media and entertainment, healthcare and life sciences, and academia. The objectives of the report are to define, describe, and forecast the market size on the basis of application, deployment type, end-user, and region. Based on the application in visualization and 3D rendering software market, architectural and product visualization have the largest market share in the visualization and 3D rendering application market during the forecast period. The market size is expected to grow as 3D product rendering helps in easy marketing, saves prototyping time and expense, and lets users see physical conditions of the product. Marketing and advertisement is expected to record the highest market growth rate during the forecast period, as with the help of visualization and rendering technique consumers get to see a realistic picture of how their image or animation is going to turn out. 3D rendering creates an effective marketing tool giving a potential client a full visualization of a space or building; whereas architectural and product visualization is the second fastest growing market during the forecast period. In the deployment type segment of the visualization and 3D rendering software, the cloud-based solution is expected to grow at the highest CAGR during the forecast period. Enterprises and organizations are relying heavily on the cloud services and cloud platforms to obtain resources on demand. With cloud deployment, organizations pay for the resources that they use, which helps them reduce the cost of capital. User friendly renderer interface drive the visualization and 3D rendering software market. Architectural 3D rendering has emerged as a key marketing tool as it provides a photo-realistic and professional visualization of future development. Many real estate companies have started investing in the architectural 3D rendering services. This is especially beneficial for marketing and client presentations. Building properties take time, and competition can be stiff. Real estate developers pre-sell these properties before they are even built. 3D rendering also enables clients to see how the property would actually look once the construction is finished. The media and entertainment industry is growing at a phenomenal rate. The market for digital special effects is growing in Latin America, APAC, Northern Europe, as well as the US. This can be witnessed in the rise of 3D cinema screens all over the world. The gaming industry is also increasing at an exponential rate. The evolution of 3D technologies such as auto-stereoscopy that allows viewing 3D images without using glasses is driving an expansion of 3D technology to mobile devices as well. Over 90% of the mechanical design engineers across the world use 3D rendering to produce engineering designs for product manufacturing. The ever-rising popularity of 3D rendering is due to the high resolution, perfection, and quality of product designs that engineers can produce by using these techniques. 3D rendering is the most viable option to rely upon because of the detailed and crystal clear three-dimensional visual representation of the final products it brings forth. The healthcare and medical segment is continuously adopting new technologies, devices, and solutions. At present, 3D and 4D technology is being used by the healthcare industry at a substantial rate. The use of 3D rendering is increasing in the medical domain, especially for radiological images. This technology provides help in treating affected body parts. What are the biggest application areas in visualization and 3D rendering software market? North America is expected to hold the largest market share in the market during the forecast period, as visualization and 3D rendering enhance and increase the precision of organizational procedures so as to offer enriched products to end-users. The MEA region is expected to grow at the highest rate as the region is experiencing the presence of creditable organizations that are gradually enabling the embracement of advance technologies. Innovative technological developments are benefiting all stakeholders of the market. However, lack of infrastructure in 3D technologies is may hamper business critical functions in the market. 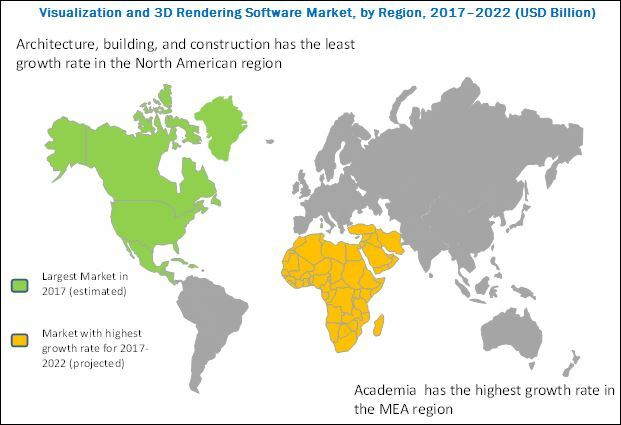 Major vendors in the visualization and 3D rendering software market include Autodesk, Inc (California, US), Siemens AG (Munich, Germany), Adobe Systems (California, US), Dassault Systèmes (Vélizy-Villacoublay, France), NVIDIA Corporation (California, US), Trimble, Inc (California, US), Next Limit Technologies (Madrid, Spain), Corel Corporation (Ottawa, Canada), SAP SE (Walldorf, Germany), Chaos group (Sofia, Bulgaria), The Foundry Visionmongers Ltd (London, UK), NewTek, Inc (Texas, US), Render Legion S.R.O. (Prague, Czech Republic), Luxion, Inc (California, US), and Cristie Digital Systems (California, US). These players adopted various strategies such as new product launches, partnerships, agreements, collaborations, mergers & acquisitions, and business expansions to cater to the needs of their customers. 11.11 The Foundry Visionmongers Ltd.
11.15 Christie Digital Systems USA, Inc.
*Details on Business Overview, Product Offerings & Business Strategies, Key Insights, Recent Developments, MnM View Might Not Be Captured in Case of Unlisted Companies.